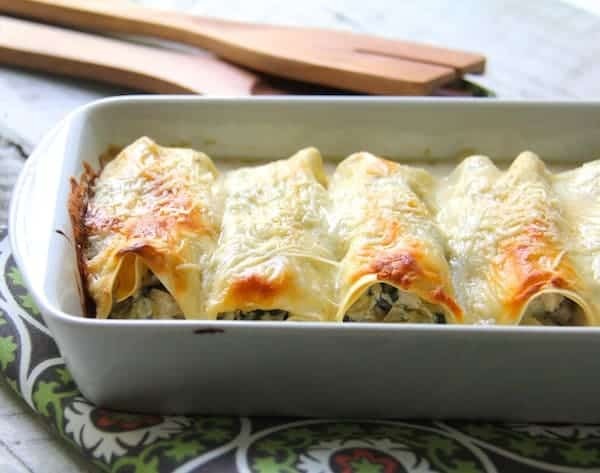 Chicken, Spinach and Artichoke Cannelloni is elegant enough for a special dinner for two and you don’t even need to boil the pasta! Most baked pasta dishes are not easy to do on a small scale and who wants to eat the same thing for an entire week? 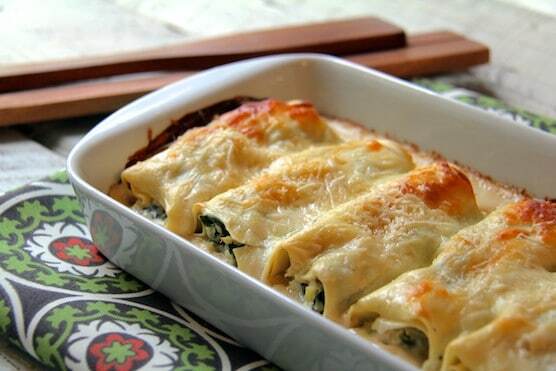 This Chicken, Spinach and Artichoke Cannelloni is easy to do on a small scale. It’s elegant enough for a special dinner for two and you don’t even need to cook the pasta first. Cannelloni and manicotti are terms that get used interchangeably, however, subtle differences exist. Basically, cannelloni is made with sheets of pasta or crepes and rolled to contain the filling while manicotti starts with large dried pasta tubes and is then stuffed. Flat no-boil dried lasagna noodles (such as Barilla) work perfectly in place of fresh pasta sheets or crepes. The noodles require only short soaking in hot tap water so that they’re pliable for rolling. Because it’s just my husband and myself, I didn’t want to purchase an entire container of ricotta cheese for the filling. What generally happens at our house is we use only a small amount and then have to figure out how to use the rest. Ricotta does not keep as well as cream cheese and I end up throwing half of it out. Instead, I used spreadable cream cheese flavored with onions and chives. I only used half of an 8-ounce container here, but the remainder is easier to use up than ricotta. Use frozen artichoke hearts if possible. Frozen artichoke hearts have better flavor than canned. If you can find them in a bag versus a box, you’ll be able to remove what you need and return the rest to the freezer for use at a later date. The Chicken, Spinach and Artichoke Cannelloni is then smothered in a creamy Parmesan bechamel. A bechamel is a simple, white roux-based sauce that actually has roots in Italy. When topping the cannelloni with the sauce, be sure to leave the edges slightly uncovered so they get nice and crispy when baked. Chicken, Spinach and Artichoke Cannelloni is elegant enough for a special dinner for two and you don't even need to boil the pasta! Preheat oven to 375 degrees. Spray an 11 x 7-inch baking dish with cooking spray. Set aside. Fill a shallow pan with hot tap water. Soak the lasagna noodles until pliable while preparing the filling. When pliable, drain and pat dry with paper towels. Place spinach in a microwave-safe container and add 1-2 tablespoons water. Microwave on high for 1 to 1 1/2 minutes or until wilted. Drain, cool, squeeze out any excess water and coarsely chop. Combine spinach, artichoke hearts, chicken, cream cheese, garlic, 1/4 cup Mozzarella cheese and salt and pepper to taste in a bowl. Set aside. Heat butter over medium-high heat. Add flour and cook 2 minutes, whisking constantly. Slowly add milk, whisking constantly. Bring to a boil, reduce heat to low and simmer until thickened. Stir in salt and pepper, 1/4 cup grated Parmesan cheese and a pinch of nutmeg. Pour 1/2 cup of the sauce on the bottom of the prepared baking dish. Cover loosely with aluminum foil. Bake for 25 minutes. Remove foil and bake another 20 to 25 minutes or until top is lightly browned and sauce is bubbling. MAKE AHEAD: Can be prepped 1 day ahead. Prepare up to the point of baking and refrigerate. Even the picky eaters at our house had seconds of the inexpensive, easy, and delicious recipe! I copied the recipe and gave it out to those I work with. Thankyou for sharing! Hi, Ben, Thanks for your feedback! 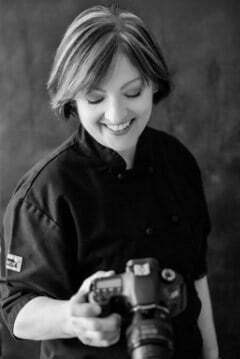 I love sharing my recipes and glad you enjoyed! Love cannelloni. This looks so rich and creamy, perfect comfort dish for the winter blues. And the artichoke, cream cheese, spinach, chicken filling sounds fantastic. Cannelloni is my favourite pasta dish ever.. so I definitely am craving this dish right now. Love it! This looks incredible! Would make a great Valentine’s day dinner! Yum! These look really yummy! I would love to try them but I don’t see how much milk to use listed in the ingredients. Hi, Ruby, Thanks so much for pointing that out! What on earth…..I remember typing it! I have corrected the recipe–it’s 2 cups. Talk about a delicious comfort food during these cold months! I love how you adapted this recipe for a smaller number of people, I plan to make this ahead, and then just pop it in the oven before dinner time. Thanks for the recipe. Now I’m off to check out some of your other Italian casseroles like butternut squash lasagna.